To understand how to identify these categories, first we’ll need to understand the difference between independent and dependent clauses. A simple sentence contains one independent clause. 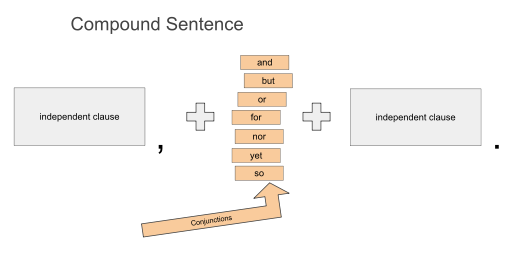 A compound sentence contains two independent clauses. The two clauses are joined by a conjunction (or coordinating conjunction). He cooked dinner is a complete thought or sentence, with a subject and verb. She cleaned up is also a complete sentence with a subject and verb. The coordinating conjunction, and joins the two independent clauses together to form a compound sentence. See the examples below. Can you identify the subject and verb? In the previous examples of compound sentences, if you did not have a coordinating conjunction and merely separated the two independent clauses with a comma, you would be creating a comma splice, which is incorrect punctuation (and arguably the most common punctuation error). Catch-22 is widely regarded as Joseph Heller’s best novel, and because Heller served in World War II, the novel packs an extra punch(modified from Purdue Owl). Although I like to go sailing, I haven’t had the time to go lately, and I don’t have a sailboat anymore. We decided that the movie was too violent, but our children, who like to watch scary movies, think they should be able to see it. Questions? Comments? Need further help? I teach creative writing, and was recently reading over a student’s personal essay. He was a strong writer, with a large vocabulary, wonderful use of language, and rarely, if ever, had a sentence level error in his assignments. However, his essays were the most tedious, frustrating, bewildering essays I have ever had to read in my life. On the day of our one-on-one conference, I struggled to communicate the problem. His word choice was perfect, his verb use all action, his imagery poetic. I reinforced everything he was doing right, though I kept coming back to, “but. . .”. YES! That was it! It had been so long since I taught sentence types that I had lost the ability to think in sentence types. For native English speakers, sentence types come intuitively; however beginning writers sometimes confuse their message by failing to use the most simple grammatical structures. He was right. He needed more simple, declarative sentences. A declarative sentence “declares” a fact. 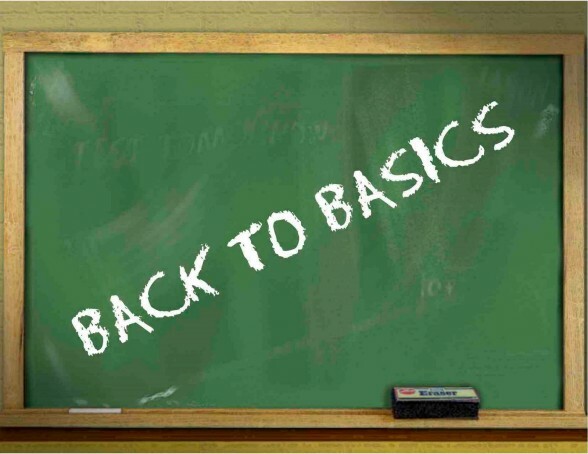 It is used to make a simple statement or convey information. Declarative sentences can either be positive or negative. Sue did not forget the tickets. David was not late for class. Imperative sentences request, instruct, or command. When no subject is given, it is implied in an imperative sentence, meaning it is understood to whom the request or command is made. Which dessert should I order? Who is the actress in that movie? The exclamatory sentence is a sentence that is exclaimed, emphasizing excitability or emotion. It is punctuated by an exclamation point. Be careful not to confuse an exclamatory sentence with an interjection; both are punctuated by an exclamation point, but the interjection is a word, not a complete sentence. Declarative: She left this morning. Interrogative: She left this morning? Exclamatory: She left this morning! You might not be familiar with the term “Appositive,” but I guarantee you have used them in your writing. 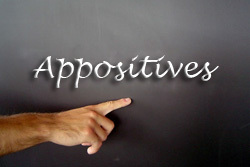 What is an appositive? An appositive is simply a noun or noun phrase (or pronoun) that elaborates on another noun or pronoun, offering further explanation or information. Ernest Hemingway, the American novelist, is often referred to as a minimalist writer. In the previous example, “the American novelist,” is in apposition to the noun, “Ernest Hemingway.” The second noun phrase offers more information to describe the previous noun, in this case, a proper noun. This type of appositive phrase is called nonrestricted, therefore it is set off with commas. The appositional phrase in this sentence is not essential to the meaning of the sentence. The phrase “the American novelist,” could be omitted without changing the meaning of the sentence. It might be easier to remember that nonrestricted and restricted appositives are sometimes referred to as “essential” and “extra.” Are the words describing the noun essential (restricted) information, or is it “extra” information that you don’t really need, but it’s nice to know? If the information is essential, you don’t use commas; however, if the information is extra, you do use commas to set it off. Extra information = extra commas. The teacher, a gray-haired taskmaster, was waiting for the students to be seated. In this appositive example, “a gray-haired taskmaster” offers further (extra) information to describe the noun, “the teacher.” Commas are placed around this phrase, as it is extra or nonrestrictive, meaning the appositive could be omitted without changing the intended meaning of the sentence. It’s simply extra information that tells us a little more about the teacher. Can you pick out the appositive in the example below? An undergraduate, Karen, raised the question about grammar. If you said Karen, you are correct! Is Karen’s name essential information, or extra information? If you said Karen’s name was NOT essential, you’re correct. The sentence was about a student, one of many, who had a question. Leaving out the appositive (Karen) would still convey the same thought: “An undergraduate student raised the question about grammar. I would like to dedicate this book to my father, the Pope, and my best friend. I would like to dedicate this book to my father; the Pope; and my best friend. Now that the items are separated by semi-colons, “the Pope” is NOT an appositive, but simply one of three people the writer dedicates his book to. Appositives are tricky. Just remember, extra info, extra commas. Below are more examples of appositives http://grammar.quickanddirtytips.com/appositives.aspx. April is National Poetry Month, and those of us at MCC’s Writing Center love our poetry. You might not think reading and writing poetry could help you with your academic, fiction, or nonfiction writing, but you might be surprised how poetry can improve your overall writing. How? Let me count the ways. Less is more, and poetry can help writers uncover the words that are truly essential. For poets, word choice is everything. Poets toil over every word, and not a syllable is wasted, so it is imperative they chose the perfect word. Words paint pictures, and the color “red” is different than “scarlet,” which is different than “cherry,” which is different than “crimson.” Want proof? Look at the “red” uniforms of the Nebraska Cornhuskers, the Kansas City Chiefs, the Arkansas Razorbacks, and the Ohio State Buckeyes. Plain old red isn’t exactly the color of all their uniforms, is it? Is something simply noisy, or is it deafening? Were you happy, or would “ecstatic” be more accurate? Or even euphoric? In the poem below by Bruce Guernsey, he uses the word “shack” instead of house and “drifts” instead of simply snow. Also, look at his choice of verbs. What other choices do you suppose he made? Has your instructor every told you to “show, don’t tell”? Did you wonder what exactly that meant and how to achieve it? Poets show in words by painting a picture for the reader. Poets use imagery with sensory detail, showing what something looks like, feels like, tastes like, sounds like, and smells like. Do you hear a bird chirping, or is it a robin singing “cheerily, cheer up, cheer up, cheerily, cheer up”? Did the hospital room smell bad, or did it smell like formaldehyde and urine? Sometimes poets use simile, metaphor, and even personification. The poem below by Ted Kooser utilizes several of these poetic tools. Can you pick out the sensory detail? Do you find any simile, metaphor, or personification? Has your instructor ever said your writing is plodding, or you need to vary your sentence structure? What he or she is trying to tell you is that you need to work on your rhythm. 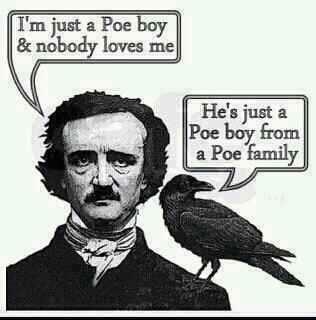 In poetry, one must consider the musicality of the language. Cadence and melody create the musical quality of poetry. Poetry is musical language, and can generate a physical response; we want to tap our feet and nod our head in tune with poetry. In the following poem by Theodore Roethke, he describes his “Papa’s Waltz” but also writes in the beat of a waltz. Can you figure out where the stresses or “beats” are? Poetry is like music: there is something for every taste. If you had a bad experience with poetry in grade school or high school, give it another chance. You might find something you like. Do you have a poem you’d like to share online? Send me your poems about writing, and I’ll post on our blog the month of April. Want to learn more about poetry? Check out the links below.